Kenza Services is the ultimate choice for any attestation services in Qatar and Doha. The well trained and experienced officials in Kenza will definitely helps in delivering excellent attestation service. We, with our equipped professional team, offers attestation services both Educational and Non Educational attestations. Under educational all types of Degree, Provisional, Diploma, Bonafide letters, Board certificates and other educational related documents are handled. The services are also extended to Non-Educational attestations like, Marriage, Birth , Death and Experience certificates and other affidavits and documents. Kenza also assist you in Legal documents, Power of attorney and commercial documents attestation. We perform attestation of both educational and non educational documents from countries like India, UK, USA, Canada, Australia, Pakistan. Our team also helps in GCC attestations services. We also excels in others services like Legal translation, Visa Permit, etc. Kenza upheld quality and assures that your documents are handled and delivered to you in a safe, secured manner. 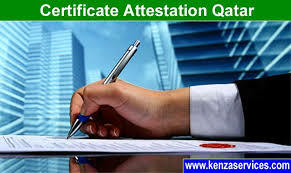 Kenza ensures the best attestation service in Qatar and Doha.